It has been since the end of last July that I did one of these, Who Inspires Me [Fashion Wise] series posts. Gosh....I'm really awful at doing this series, since I only tend to do 1-2 posts a year. Oh, well...today's post is on, Emma Stone -- who is just plain adorable! I love how her style is a mix of classic, touch of trendy, and how her own personalty shines through in whatever she wears. I suppose that I should first share how I discovered, Emma Stone. I think it was the spring of either 2011 or 2012, when I started seeing ads of Emma for Revlon everywhere. [Those ads may, or may not of influenced me to first try Revlon out.] Emma also started popping up everywhere online, and I instantly loved all of her outfits, hair, and makeup. Then of course, last spring I saw Emma Stone in The Amazing Spider-Man -- which instantly become one of my top favorite super-hero films. The other one is, Captain America: The First Avenger, so to say the least, I'm kinda excited for this year since the sequels for both those films come out this year! But wait. This wasn't supposed to be a post on my favorite super-hero films, but on Emma Stone's fabulous style. This outfit is adorable & has a slight English flair. It is also an outfit that I would, and can easily recreate. Hmm...maybe I should someday. This first outfit is from The Amazing Spider-Man, and not from her own personal life, but I still love it. A great basic dress, cardigan, and some boots. LOVE. The second outfit is cute too, with some skinny jeans, oxford flats, flowly blouse, blazer/jacket, beanie, and a cambridge satchel. We can see already that Emma really loves her skinny jeans, oxford flats, jumpers, peter pan collard blouse, and a nice classic coat. I love these two outfits of Emma's. The first outfit is a fun twist of the LBD with the white peter pan collard & contrast stripe down the front. The second outfit features a fun pencil skirt with a drape flounce down the front, which I think is fun, but wouldn't look good on me. The tee shirt is amazing, since it mixes stripes & a statement necklace into the design, and of course, her red heels add the perfect touch! What do you think about Emma's style? What is your favorite outfit of her's? I love her sense of style! So simple, so english, so stylish! Love her style, although I've never heard of her to till just now! The Spider-Man outfit is my fav! Emma Stone is so cute, and I love her style! 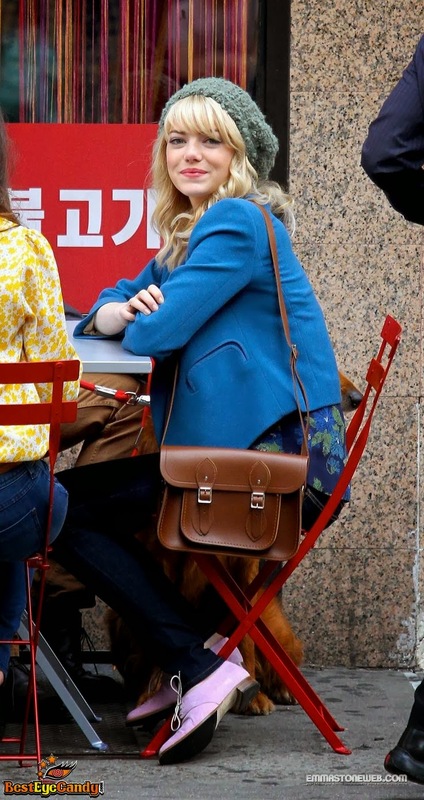 I also really like her outfits as Gwen Stacey in The Amazing Spider-man (although those outfits aren't really her choice.) I think one of the main things I lie about her, is that she wear cute, fashionable things that look good on her, but they are still usually modest. :D Thanks for this post, I really enjoyed reading it! Her style is indeed very cute!